I guess when I was around 12 or 15... I had an existential crisis, and I was reading various books on trying to figure out the meaning of life and what does it all mean? It all seemed quite meaningless and then we happened to have some books by Nietzsche and Schopenhauer in the house, which you should not read at age 14 (laughter). It is bad, it’s really negative. So then I read Hitchhikers Guide to the Galaxy which is quite positive I think and it highlighted an important point which is that a lot of times the question is harder than the answer. And if you can properly phrase the question, then the answer is the easy part. So, to the degree that we can better understand the universe, then we can better know what questions to ask. Then whatever the question is that most approximates: what’s the meaning of life? That’s the question we can ultimately get closer to understanding. And so I thought to the degree that we can expand the scope and scale of consciousness and knowledge, then that would be a good thing. The moment I fell in love with reading –and, to an extent, with writing too– came 5-or-so years later. 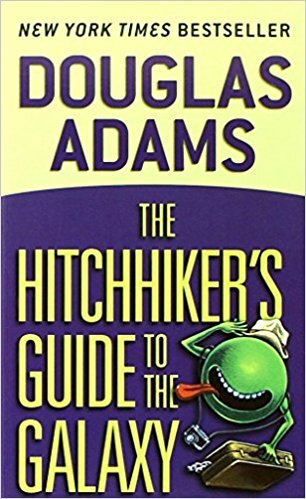 I don’t remember why exactly, but I started reading Douglas Adams’ “The Hitchhiker’s Guide to the Galaxy“. And I couldn’t stop reading it: I read all the books in the series in two months or so; and then I read everything else Douglas Adams had written. Few technical books and a bit of everything. The following books are currently sitting on my bedside table: "The Hitchhiker's Guide To The Galaxy", "Predictable Revenue", "Manufacturing Consent", "Agile Application Security". "Oauth In Action", "Serious Cryptography". Not sure what you’ll learn from HHGTTG, but it’s one of the funniest series of books of all time and if you haven’t read it you pretty much have to. It’s actually a five book series that’s called a trilogy, and if Adams hadn’t died of a heart attack at age 49 in 2001 there would have likely been more books written. HHGTTG and the WWII epic Catch-22 are among my favorite books when contemplating the meaninglessness and hilarity of life (HHGTTG begins with the Earth being destroyed to to make way for a hyperspatial express route). Like Dune, skip the movie, it doesn’t do the books justice. Favorite non-business book is Hitchhiker's Guide to the Galaxy. It's science fiction meets adventure meets comedy with a large dose of British humor.